If angling is your game, then you have come to the right spot! Lough Mask, renowned world wide for game fishing is on our doorstep. You are in the heart of prime fishing waters within minutes of Isham Self Catering and Angling Centre. This area of Lough Mask has a good stock of sizeable Brown Trout, Large Ferox Trout and Gillaroo Trout. There are good hatches of duckfly and olives early in season and sedge and buzzer later on. This area of the lake is renowned for its ‘May Fly’ hatches with first hatches appearing in the area of Inishgleastai, 2 minutes from Isham Self Catering and the mouth of the Corrib Mask Canal. Dringeen Bay is excellent for evening dry fly ‘Buzzer’ Fishing throughout the summer. There is also some very good ‘Coarse’ Fishing for Pike. 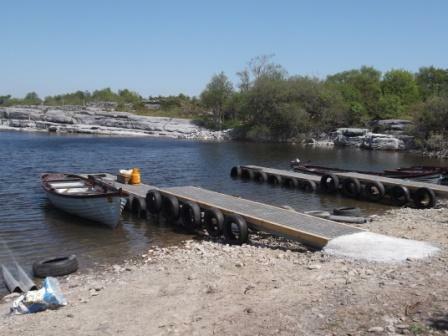 If you want a little bit of variety, why not fish on Lough Corrib, which is only 2 miles away in Cong. 15th February to 30th September. Boats available for hire – with or without outboard motors. Please contact us for our very best rates. Angling Information also available on request.